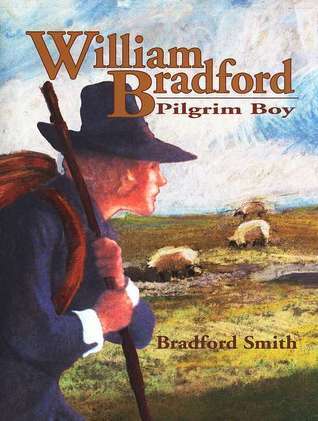 We fell in love with William Bradford while reading this book. He faced so many injustices in his childhood but he let them shape his good character. Another great read a-loud. Kids and I enjoyed this book a lot. I asked the kids one thing they remember most about William Bradford and my daughter says "he lost a lot of people in his life". He really did....but still was such a strong man. The first chapters are encumbered by a belabored comparison of the Bradford family's shepherding to the Good Shepherd, Jesus, and this cost the book an entire star for my review. Nonetheless, carry on good reader! This biography focus' more on Bradford's early life experiences in England, how he came to see America as a land of religious freedom worth sailing for, and how he fared after arriving. Parents will want to know the dark story of the demise of Bradford's first wife is handled delicately, and with brevity.This is a lovely read-aloud, with a somewhat non-traditional approach to the Pilgrims and the Thanksgiving story. By developing the back story of Bradford's life, the author shines fresh illumination on the Plimouth settlement, as well as provides numerous opportunities for children (and parents) to relate to Bradford. The overall effect is wholesome and inspiring. A perfect compliment to the Kate Waters series that we so much enjoy. Highly recommended. A great introduction to William Bradford, the governor of Plymouth Colony. Perfect for upper elementary-aged students. I thought it told a lot about his life. One time he touched the king and the king swatted him. A great introduction to William Bradford for children. My 4 year old enjoyed it even though there aren't many pictures. I read this book for history . I liked it a lot!